Who wants to live in a pole barn? Well, more people than you might think! But these are not your ordinary pole barns. They are post-frame homes. 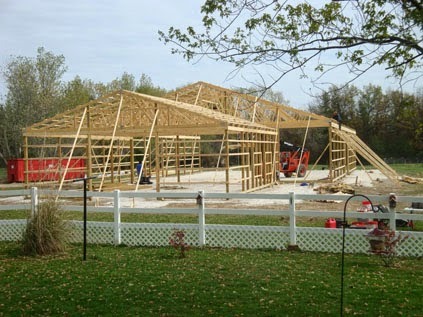 Over the past 15 years, National Barn Company has had many people inquire about using post-frame construction for new homes. Six years ago, National Barn started a company called Legacy Homes to specialize in this area and to handle the growing demand for this type of home. Legacy Homes provides design/build post-frame homes and offers several construction choices including the construction of the exterior shell only, a complete rough-in, or turnkey construction within 100 miles. We believe there are several reasons for the increased interest in this type of home. The homes are typically much more affordable than conventional framing for the exterior shell. When metal siding is used, the savings, compared to similar-sized stud-wall homes, is nothing short of astounding. We find most of our customers would rather spend the majority of their money on the interior of the home and save as much as possible on the exterior. We construct most of our homes using metal and/or masonry exteriors, making exteriors literally maintenance- free. The wall cavity is typically six- to eight-inches deep, filled with R-19 to R-25 insulation, depending on the type of insulation used. Additionally, we wrap solar insulation under the metal. The two types of insulation provide an R-30 or better thermal resistance rating for the wall cavity, making these homes extremely energy efficient. This provides continuous savings for the homeowner. We typically construct the exterior shell, including concrete and rough-in plumbing, within 20 days and we usually complete a turnkey home within 120 days. This is very attractive to homeowners who need to relocate quickly, and it helps them convert their construction loans into mortgages before interest rates rise. Most insurance companies offer discounted rates if homes have metal roofs. Unlike shingled roofs, metal roofs do not need to be replaced every 10 years. The use of metal on the exterior also provides homeowners a wide variety of color choices for the roof, siding wainscot and trim. We typically use vented metal soffit panels, continuous vented ridges and gable vents to provide proper attic ventilation. We have many standard floor plans to offer, but we also work with customers to design custom floor plans tailored to their needs. We draw all our plans with software that allows us to "walk" customers through the houses on the monitor before construction starts. This is a helpful tool for people who struggle to visualize what drawings represent. A typical post-frame home is a ranch with a roof pitch between 4/12 and 7/12. Homeowners often choose to add covered porches on the front and many also add one on the back. Most of our homes have concrete slabs and standard interior finishes. Most consist of metal siding and roofs, with masonry, wainscots or accents. We have constructed some post-frame homes in the city limits, but most currently are built in rural locations. Because post-frame is exceptionally more resistant to wind, snow and seismic loads than nearly any other kind of building, we have several distinct market advantages. Because of post-frame's unique diaphragm design, materials are used very efficiently and there are fewer building components to install than in most other types of buildings. Quick construction and less material to install result in economical construction costs. Post-frame's wide wall cavity and superior insulation qualities provide long-term energy savings. The durability of metal siding and roofing make the homes maintenance-free. It is little wonder that these and other factors make this a growing market niche for post-frame. As NFBA works to grow awareness of the qualities and versatility of the post-frame building design, we expect to see even more growth in this market segment. We can beat traditional stud-frame construction costs, and create better quality structures than less expensive modular homes. However, builders should be aware of some issues. Some cities may have their own housing codes that exclude everything but traditional-built homes. Because the area lacks "comparable" structures nearby, some appraisers may undervalue post-frame homes. There is no good reason to do so, because the homes generally look the same as traditional homes that also use metal siding and roofing. Sometimes there are problems getting mortgages, too, if lenders are unfamiliar with post-frame. We have established relationships with mortgage companies to help address this problem. Most obstacles to growth of the post-frame housing sector result from a lack of awareness or from prejudice against post-frame buildings. Persistence is overcoming the problems, and the NFBA is helping with a nationwide marketing program that promotes the positive attributes of post-frame buildings. If you are ready to grow your business in a new direction, do some research and consider building post-frame homes. Brian Keane is president of National Barn Company-Legacy Homes. He serves on the NFBA board of directors.